Could the police even tell you've used a "second-hand" sticker in your car? UPD: after reading the answers I realized this is clearly against the rules and not worth the hassle. I'll have my friend keep the vignette as a souvenir. Can the motorway charge sticker be transferred in the event of a change of car? No. It is forbidden to peel off motorway charge stickers and transfer them to other vehicles. Detached motorway charge stickers are invalid. We and the police check compliance with the obligation to display a motorway charge sticker on motorways. Anyone using the motorway without a motorway charge sticker is subject to a fine of CHF 200. This applies also if the motorway charge sticker is misused (not affixed correctly or affixed in the wrong place). In addition, a motorway charge sticker must be purchased and correctly affixed to the vehicle. 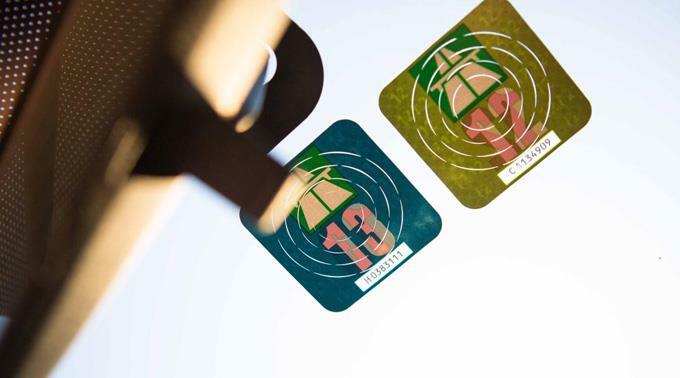 Forging a motorway charge sticker or using such a sticker leads to a report being filed with the Office of the Attorney General of Switzerland. A fine is likewise imposed if the motorway charge sticker is reused (i.e. used on several vehicles). No, it is definitely not legal. The sticker is also designed to be difficult to remove cleanly (if you look carefully you will see that once it's on the windshield, it's not a simple square but a kind of spiral with many nooks, not at all like a random sticker or even the Austrian motorway vignette) and invalid if not affixed to the windshield. If you manage to get if off and affix it to another windshield cleanly, they have no way to tell. I know people who have done so and I have heard of various tricks to make removing it easier. But it is more difficult than you think. Never attach it with adhesive tape or film so that it is easy to remove and transfer to another vehicle. You could be fined several hundred fines if the police catch you. What’s the easiest way to remove old vignettes? The best way is to use a ceramic hob scraper. It’s even easier if you warm the sticker first using a hairdryer. Any adhesive residues can be cleaned off with nail polish remover. Of course as one of the other answers says, if you do manage to remove it without destroying it, there'll be no way of noticing it. 1 The motorway charge is paid by the purchase of a motorway sticker (sticker). 2 The sticker shall be affixed directly to the vehicle before the use of a national highway subject to the charge. 3 It can only be transmitted with the vehicle. b. It is detached from its support without being glued directly to the vehicle. 1 Any person who, contrary to ss. 3 to 5, 7 and 8, intentionally or negligently borrows a national highway subject to the levy at the wheel of a vehicle or uses the vignette in a manner contrary to these provisions shall be liable to a fine of 200 francs. Use of butter is less of a serious fraud than use of a removable substrate, because the latter is applied forgery, whereas the former is only the use of a bit of butter on the vignette. you must affix it directly, however, the notion of it being properly glued or not is not discussed in the legal article... The vignette is void if it is removed after having been "PROPERLY STUCK ON" however, they place a semi-colon after that voidance condition; not a full stop; and they do not discuss any scenarios whereby it the vignette is removed after it is not properly glued on. I will recap: It cannot be transferred between vehicles. It must be stuck directly to the car... It is void if it is removed after having been STUCK CORRECTLY" If it is removed after having being glued incorrectly, using butter, the legal statement is implicit and not explicit, there is room for interpretation. the fine may have changed it may be 500fr. in practice this kind of fraud is notoriously common. one guy writes " i apply a thin layer of greasy cream before applying the sticker, so it is very easy to remove, is it legal ? " they put butter too. they don't even know very well themselves if the trick is legal. it's better to do that than carefully applying it to a second sticker and cutting around it. Not the answer you're looking for? Browse other questions tagged legal driving switzerland or ask your own question. If you have a rental car from outside Germany, can you enter the environmental zones? Can you leave and return to Switzerland if you have a Swiss residency permit? Can I drive a Swiss-registered rental car in the EU as an EU resident?